The adage that ‘you are what you eat’ is a given truth at SwaSwara. Good food- planned and appropriate - is an intrinsic part of wellness. They are chosen made with care to hasten the process of wellness in you. You are welcome to visit our interactive kitchen gallery to understand and partake of this intensive and complex culinary process dedicated to wellbeing. 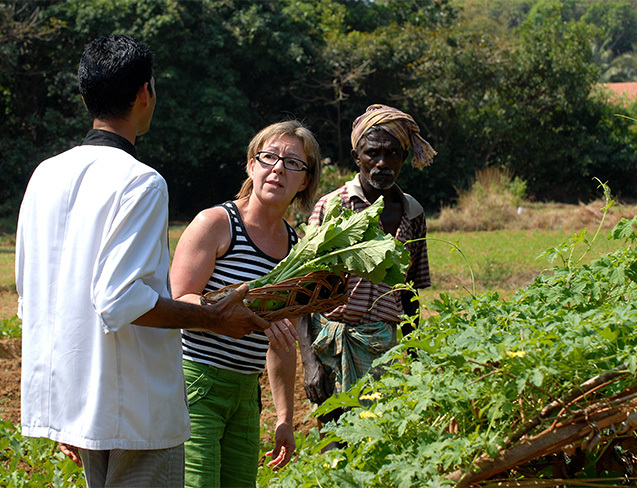 Much thought goes into the ingredients for the SwaSwara kitchen . We prefer to make food that is grown in harmony with nature, ripened naturally on healthy soil and cooked with an air of mindfulness. Our fresh produce - from the organic vegetable farm at SwaSwara and the neighbourhood - consists of seasonal tropical fruits,vegetables and freshly caught seafood. These are complemented with juices and herbal teas. Dairy and eggs are limited in their use as is the use of oils in our preparations. For those on the Swa Wellbeing, wine is offered. Our menu does not feature meats, hard liquor, refined sugar or refined flour. Much thought goes into the ingredients and cooking modes at the SwaSwara kitchen. You'll find no refined sugar, wheat, processed foods, dairy items or conventional additives in any of the meals we serve. They are also customised according to your specific condition and needs. Our understanding of food, in all its dimensions large and small, is deeply influenced by one aspect and that is good health. It is a labour of love, beginning with the selection of ingredients from our gardens and stretching into its careful preparation, customisation and serving. In the course of perfecting this process we seem to have , quite inadvertently, created a science of food crafting that a lot of our guests want to know about. And so it is that we have turned our kitchen at SwaSwara into a sort of visitors gallery that facilitates interactions with our chefs and experts on the distinctive art of health cooking.